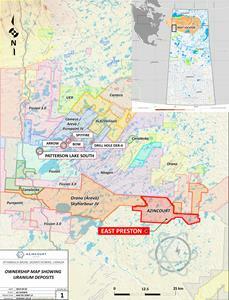 AZINCOURT ENERGY CORP. (“Azincourt” or the “Company”) (TSX.V: AAZ, OTC: AZURF), is pleased to announce preliminary results from the recent helicopter-borne Versatile Time-Domain Electromagnetic (VTEM™ Max) and Magnetic survey conducted over the southeastern portion of the East Preston Uranium Project, located in the western Athabasca Basin, Saskatchewan. The Company also announces that it has reached an agreement with Skyharbour Resources in which Skyharbour has agreed to accept 2,000,000 common shares (the “Settlement Shares”) of the Company in settlement of a portion of the cash payment owing to Skyharbour in connection with the acquisition of an interest in the East Preston Uranium Project. As partial consideration for this interest in the project, a payment of $150,000 is owing to Skyharbour. The Settlement Shares are being issued in settlement of $100,000 of the payment owing to Skyharbour and are being issued at a deemed price of $0.05 per share. The balance owing to Skyharbour will be paid in cash. This press release includes “forward-looking statements”, including forecasts, estimates, expectations and objectives for future operations that are subject to a number of assumptions, risks and uncertainties, many of which are beyond the control of Azincourt. Investors are cautioned that any such statements are not guarantees of future performance and that actual results or developments may differ materially from those projected in the forward-looking statements. Such forward-looking information represents management’s best judgment based on information currently available. No forward-looking statement can be guaranteed, and actual future results may vary materially.